I have a Patreon page, a site that enables creators to continue to create stuff and things! I’m too tired to check the official date of when The Bookstore went into business, but suffice it to say that it’s been a while. With this time, decades of time, running a business, you’d think they’d have figured out the supply chain thing a bit better. 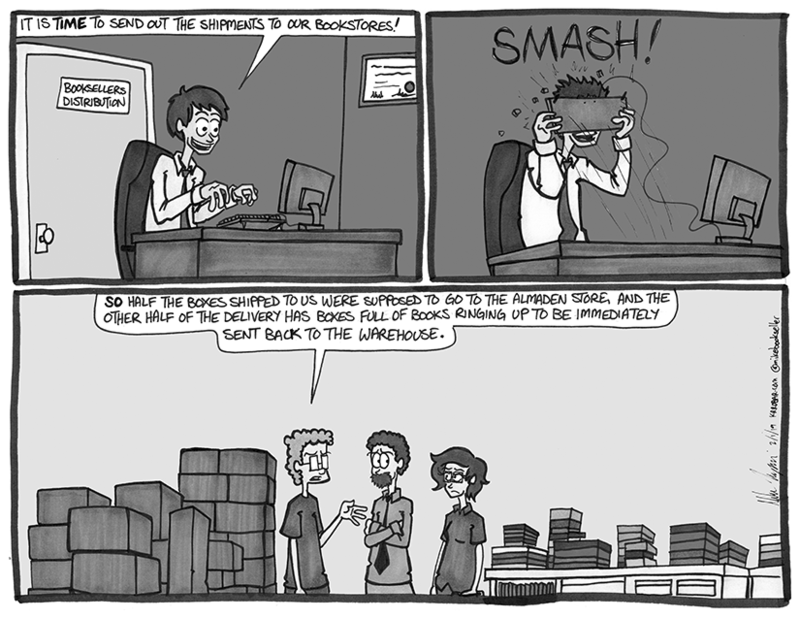 I don’t know everything that goes on behind the scenes with how books are shipped in and out of the stores, how long boxes sit in warehouses, or any nitty-gritty stuff of that nature. I’m aware of systems in place that say if we sold a book on Monday we should get a replenishment copy by around Friday. With that system, is it too difficult to know that, when we need to send a bunch of copies of books BACK to the distribution centers, those distribution centers NOT send us MORE of the books we need to send back? What am I not seeing with this? Why are we getting multiple copies of titles right out of the boxes, that were just shipped to us, ringing up to be shipped right back? Also, a while back I had a truck driver speed through a drop off of some pallets of boxes that were supposed to be for our sister store 15 miles away. That was a fun afternoon of phone calls, emails, and frustration. I know time is of the essence but I’d like to believe that taking a couple extra seconds to read an address can save a lot more money in the long run.